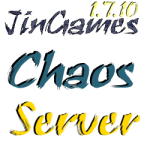 The Chaos Server starts the new year off with a bang: by Reopening!!! The server has been completely redone!!! Come check it out if you want. We are going to be working on a revamp of sorts so it is recommended to join the discord to give us feedback on any plans. This server is unique in the way that’s it’s fully pvp, making it super fun. Would love to see it thrive and be super popular! jingames i know its not rly about the chaos but i wanted to contact you about the naruto c im making a server not trying to ad it but we wanted to ask you can you work a bit more on naruto c like add sage mod and more sharingan kinds thank you for every thing s.K. Can You Make Tokyo Ghoul Mod ??????????? ?